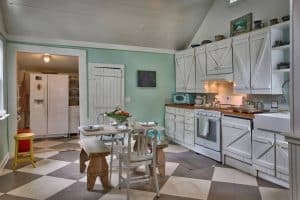 We are excited to introduce one of Daufuskie Island’s newest vacation rentals, “The Oyster Cottage”. 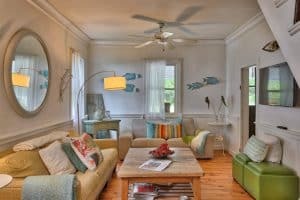 This historic gem is beautifully decorated in handcrafted artwork and has been featured in several national magazines, Coastal Living and Southern Living to name a couple. 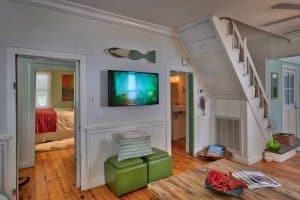 Offering 3 bedrooms/1.5 baths, this is the perfect island getaway for family’s who want to get back to the basics such as low country front porch conversations, reading, writing, swinging under the old oak tree, bike riding, trips to the beach, board games, kayaking, golf cart rides, camp fires, movie nights and simple relaxation. 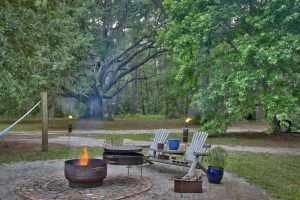 Check out this stunning airbnb and book your unforgettable Daufuskie Island getaway today! *Margaret- You must stay here!! Rachel and Chase are excellent hosts. Very quick to respond to any needs or questions and went above and beyond to make our stay a comfortable one. 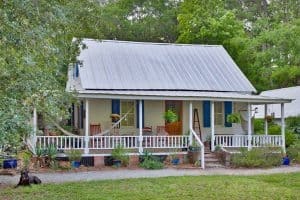 The oyster cottage is perfect for your stay on Daufuskie Island. The wrap around porch is the place to relax in the evenings after a beach day. It has all the necessities for your cooking needs. We also highly recommend Tour Daufuskie for your golf cart rentals. Anna was very helpful throughout the process. We hope to come back soon! *Caprice- I’m not sure where to begin. I’m from Alabama, and The Oyster Cottage and Daufuskie remind me of growing up and visiting my great grandparent’s and grandparent’s homes. The Oyster Cottage is so very quaint and charming and every step you make, you are assured that loving hands went into building this home. This is the real Daufuskie life. The Island…OH MY the island. If you enjoy history, the outdoors, walks on the beach and fresh air, this is the place to visit. Rachel and Chase were such great hosts, giving us tips on all the local places to visit and things to do. There are not many restaurants and no grocery stores, but don’t worry!!! Daufuskie is a place to refresh your family and your soul!!! Don’t be afraid to bring everything that you need for your visit that will fit into your car. The folks at the ferry and the transport team will make sure that you and your belongings get to the Oyster Cottage without a fuss. I cannot say enough about Rachel and Chase, The Oyster Cottage and Daufuskie Island. Now planning trip number (2) to return with my parents!!! *Allison- This was an awesome cottage! This was our first time to the island and the Oyster Cottage was perfect for our family. Very comfortable and quaint. The house is historic and has such a great warm feel about it. The owners were great about answering questions regarding the island and were very helpful. We really had everything we needed for a week’s stay. Very clean and cute! I would highly recommend Rachel and Chase’s place! *Ashley- What an experience!! Our stay at Chase and Rachel’s was truly amazing! The home is straight out of a Pinterest board and the area is just storybook stunning. So many wonderful features that felt historic and authentic while still having the joys of modern technology. We’d stay here again and encourage anyone looking for an island getaway to do the same! 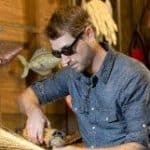 Chase is the owner of Tour Daufuskie and The Iron Fish gallery.